FAQs – Step To Own Company Sdn. Bhd. Please refer to the notes below before registering you new company with SSM Malaysia. 1. Think about your company’s new name. 3. You can be the only one Share Holder in the Company. 4. If you want to Apply MOF Licences, make sure your company has Paip Up Capital of at least RM 2,500. 5. Check with your banker to make sure that they accept your company to open bank account with them. 6. Get ready at least RM 6,000 for yearly professioanal charges for your company having turnover or RM 500,000. FAQs – Important Deadline for SDN. BHD. 1. Within 3 months from the incorporation date. Hold the first board of director meeting. 2. Within 18 months from the incorporation date. 1. Within 6 months from the financial year end. 2. 30 days before your accounting year end. Note : The above is just a portion of many more deadlines for each and every businessman/women to remember. Please give us a call and let our specialized and professional team to handle it for you so you can leave your brain more space and concentrating for the growth of your business. FAQs – Formation New Company SDN. BHD. 1. Who can become a director of Private Limited Company / SDN BHD? 2. Can a foreigner become a director of a Private Limited Company / SDN BHD? YES! A foreigner can become a director of any limited company as long as he/she fulfill the requirement Question No.1 above. 3. Who can become a Company Secretary of a Private Limited Company / SDN BHD? 4. What are the factors to consider when forming a new company?
. : Is he/she qualified as Company Secretary? Appointing a person who is not qualified as Company Secretary may lead you toward endless trouble in future. Qualified Company Secretary must be a Chartered Accountant – MIA, Chartered Secretary, Lawyer or Licenses Company Secretary.
.: Did he/she have an officer or operate form home?
. : Pricing secretary fees (retainer fees) per month, unreasonable disbursement charges, advance secretary fee payment for new incorporation etc.
.: Did he/she provide long term support and advice on Company Secretarial matters?
. : Did he/she capable of providing sufficient information and advice on corporate matters? 5. How to know that a person is member of MIA, MAICSA, Lawyer or Licenses Secretary? 6. What are the step to form company SDN BHD? – Doesn’t required signature from directors / shareholder). – Result in 1 working day. b) Submission of documentation. Our company do online registration. 7. What are the documents required for Incorporation of New Company? 8. What is the charges for Incorporation of New Company? 9. When we will start to process your application for setting up SDN. BHD? 10. Why we have the above collection policies?
. : This is because we have to pay CCM / SSM (Suruhanjaya Syarikat Malaysia, ie Registrar of Companies) RM 1,000 when we submit the documents for incorporation in Step 2. (This is for Authorised Capital of RM 400,000.00).
.: We have to order Common Seal, Minute Book, Register Book, Share Certificate Book etc. 11. What are the cost of Incorporation of New Company? Full payment before commencement of works. 13. What about your secretarial fees and charges? 14. What is SSM / CCM? CCM / SSM is the short form of the Companies Commission of Malaysia or Suruhanjaya Syarikat Malaysia, its a government body regulate companies and business in Malaysia (http//www.ssm.com.my/) CCM / SSM is not short form of some of the company secretary website which aimed at creating confusion to the public. 15. Can i form a SDN BHD all by myself? CCM is an abbreviation of The Companies Commission of Malaysia or in Malay is called Suruhanjaya Syarikat Malaysia CCM is a statutory body which regulates companies and business. They were formed as a result of a merger between the Registrar of Companies (ROC) and the Registrar of Businesses (ROB) in Malaysia. FAQs – Bagaimana saya ingin menutup perniagaan Enterprise atau Perkongsian saya? 1. Lengkapkan Borang Penamatan Perniagaan (BORANG C). pengesahan oleh pemilik tunggal/rakan kongsi. a) Sijil Perakuan Pendaftaran Perniagaan. b) Salinan kad pengenalan pemilik/rakan kongsi. perniagaan dibenarkan mendaftarkan penamatan perniagaan. tempoh 4 bulan dari tarikh kematian. Perniagaan daripada SSM dengan bayaran RM10. penjara bagi tempoh tidak melebihi satu (1) tahun atau keduaduanya. FAQs – I am foreigner, can I apply Visa under the New Company? We are licensed company secretary and we do not provide services in getting the business / working visa fr the directors. The directors are to apply directors are to apply directly with the Immigration Departmenr for relevant visa. We as your Company Secretary, will assist the Company to provide all secretarial documents as requested by the relevant authorities to support the applications. We do not hold any responsibility if the Company is unable to apply any professional visa / working permit from the Malaysian Government. FAQs – Bagaimana saya ingin menutup Syarikat Sdn. Bhd. saya? Syarikat tidak mempunyai aset atau aset tidak mencukupi untuk membuat permohonan perintah pembubaran dari Mahkamah. Sesebuah syarikat yang telah dibatalkan dari Daftar disifatkan telah dibubarkan setelah notis pembatalan nama dikeluarkan dalam Warta Kerajaan. Garispanduan Permohonan Memasukkan Semula Nama Syarikat Di Bawah Seksyen 308(5) Akta Syarikat 1965. FAQs – How Much Paid Up Capital should i put for New Company? We will not know how much issued / paid up capital a company should have, you as the directors as the company, should decide what are the best for the company. We do not accept any assumption from the directors that we are expected to know EVERYTHING about your company. FAQs – Can a Company Sdn. Bhd. Open Current Account? Please visit any banks & clarify with the relevant bank for the application of opening company’s bank account before registering your new company. Foreigner without working permit/business visa or Malaysian who is blacklisted by any bank will have difficulty in opening company’s bank account. We do not hold any responsibility if the Company is unable to open bank account due to whatsoever reasons. FAQs – Fees for Secretarial Services for SDN. BHD. FREE for Lifetime Period Secretarial Advisory & Consultation. Note : Avoid using the following words for your company name’s as these are controlled words that are not allowed to be used. Note : Avoid using the following words for your company name’s as these are gazetted words that are not allowed to be used. FAQs – What is paid up capital? Paid up capital or issued capital (modal berbayar) is the amounts of fund injected into a company as the company’s funds. Once the fund is injected into the company bank account and the paper work for such increase is completed. The company may then use the fund to buy assets, for renovation, buying stocks or for working capital. a) Membayar kesemua perbelanjaan dalam promosi dan pendaftaran Syarikat. b) Menjalankan semua kuasa Syarikat untuk meminjam wang dan untuk menggadai atau menanggung akujanji, harta, dari modal yang tidak dipanggil. c) Menjalankan kesemua kuasa Syarikat yang berhubung dengan mana-mana meterai rasmi untuk kegunaan di luar Malaysia dan yang berhubung dengan daftar-daftar cawangan. d) Melantik mana-mana pihak untuk menjadi wakil Syarikat melalui surat kuasa wakil. e) Menandatangani, mengeluar, menerima dan mengesahkan semua cek, nota perjanjian, draf, bil pertukaran dan lain-lain instrumen oleh mana-mana dua orang pengarah Syarikat atau apa-apa cara yang diputuskan dari semasa ke semasa. f) Menyebabkan minit-minit dibuat berhubung dengan semua perlantikan pegawai-pegawai Syarikat, nama Pengarah Syarikat yang menghadiri mesyuarat dan semua prosiding dalam mesyuarat. Secara amnya, Pengarah mempunyai tanggungjawab yang besar di dalam sesebuah Syarikat. Mereka perlu menentukan hala tuju Syarikat, menilai prestasi perniagaan dan memastikan perancangan dilaksanakan dan sumber hasil Syarikat digunakan dengan betul serta membuat keputusan bagi kepentingan Syarikat. Sekiranya pihak Pengarah mematuhi akan segala peruntukan dan undang-undang yang ada, ianya akan melicinkan perjalanan Syarikat dan kejayaan syarikat dapat dicapai. Berhubung dengan elaun Pengarah, tiada peruntukan yang menyatakan elaun Pengarah perlu dan wajib dinyatakan di dalam ‘Memorandum and Articles of Association’. Pada kebiasaannya, perkara ini di bincangkan di dalam Mesyuarat Agung bagi menetapkan jumlah elaun bagi setiap Pengarah. Artikel 70 Jadual ke-4 menjelaskan segala pembayaran ‘remuneration’ kepada Pengarah samaada dalam bentuk gaji atau yuran mestilah mendapat persetujuan di dalam mesyuarat agung. FAQs – Berapakah Elaun Pengarah yang patut dibayar kepada Pengarah Syarikat? Secara amnya, Pengarah mempunyai tanggungjawab yang besar di dalam sesebuah Syarikat. Mereka perlu menentukan hala tuju Syarikat, menilai prestasi perniagaan dan memastikan perancangan dilaksanakan serta pendapatan Syarikat digunakan dengan betul bagi kepentingan Syarikat. Berhubung dengan Elaun Pengarah, tiada peruntukan yang menyatakan Elaun Pengarah perlu dan wajib dinyatakan di dalam ‘Memorandum and Articles of Association’. Pada kebiasaannya, perkara ini perlu dibincangkan di dalam Mesyuarat Agung bagi menetapkan jumlah elaun bagi setiap Pengarah. Artikel 70 Jadual ke-4 menjelaskan segala pembayaran ‘remuneration’ kepada Pengarah samaada dalam bentuk gaji atau yuran mestilah mendapat persetujuan di dalam mesyuarat agung. FAQs – Part 1 Perkongsian Liabiliti Terhad (PLT)? PLT merupakan satu bentuk perniagaan alternatif yang menggabungkan ciri-ciri syarikat persendirian dan perkongsian konvensional. Ia memberikan status liabiliti terhad kepada pekongsinya dan menawarkan fleksibiliti peraturan dalaman melalui perjanjian di antara pekongsi. Kombinasi ini akan memberikan usahawan dan peniaga, sebuah bentuk perniagaan yang lebih berstruktur berbanding pemilikan tunggal atau perkongsian konvensional. Ia menawarkan fleksibiliti operasi perniagaan yang dikawal mengikut perjanjian perkongsian disamping menikmati status liabiliti terhad berbanding sebuah syarikat yang tertakluk kepada keperluan pematuhan yang ketat di bawah Akta Syarikat 1965. PLT adalah satu bentuk perniagaan yang menawarkan prosedur yang mudah dan fleksibel bagi tujuan penubuhan, penyenggaraan dan pembubaran dan pada masa yang sama mempunyai ciri-ciri dinamik yang mampu bersaing di peringkat domestik dan antarabangsa. PLT juga telah diperkenalkan di negara-negara seperti Amerika Syarikat, United Kingdom, Singapura, India dan Jepun sebagai satu bentuk perniagaan alternatif. • PLT merupakan suatu pertubuhan perbadanan dan mempunyai keperibadian undang-undang yang berasingan daripada pekongsinya. • PLT adalah kekal turun temurun. • Sebarang perubahan dalam pekongsi PLT tidak akan menjejaskan kewujudan, hak atau liabiliti PLT. • PLT mempunyai keupayaan yang tidak terhad dan berupaya untuk membawa atau dibawa guaman terhadapnya, memperoleh, memiliki, memegang dan membangunkan atau melupuskan harta. • PLT boleh melakukan dan menanggung apa-apa perbuatan dan perkara lain yang boleh dilakukan dan ditanggung dengan sah oleh pertubuhan perbadanan (bodies corporate). PLT menawarkan liabiliti terhad kepada pekongsinya di mana apa-apa hutang dan obligasi PLT akan ditanggung sepenuhnya oleh aset-aset PLT. Dalam kes perkongsian konvensional pula, pekongsi mempunyai liabiliti tidak terhad secara bersesama dan berasingan (jointly and severally liable) dengan firma perkongsian itu. • Tiada keperluan formal untuk mengadakan Mesyuarat Agung Tahunan. • Tiada keperluan untuk mengemukakan penyata kewangan kepada SSM. • Akaun tidak perlu diaudit. (g) Apa-apa maklumat berkaitan yang lain sebagaimana yang ditentukan oleh Pendaftar. Pendaftaran LLP hendaklah dibuat oleh Pegawai Pematuhan yang dilantik oleh LLP. • Semua maklumat lain yang dikehendaki untuk pendaftaran PLT baru sebagaimana dinyatakan dalam perenggan 2.1 di atas. Fi pendaftaran untuk pendaftaran PLT baru atau untuk penukaran kepada PLTadalah RM500 untuk dibayar kepada SSM. Jika anda menggunakan khidmat pihak ke 3, Fi tertakluk kepada perkhidmatan yang mereka sediakan. Hak dan kewajipan bersama pekongsi-pekongsi PLT dan hak dan kewajipan PLT hendaklah ditentukan oleh perjanjian PLT. Walau bagaimanapun sekiranya ketiadaan perjanjian berhubung apa-apa perkara yang dinyatakan dalam Jadual Kedua Akta PLT 2012, peruntukan Jadual Kedua berkaitan perkara itu hendaklah terpakai. (c) kebiasaannya tinggal di Malaysia. Selepas seseorang itu dilantik sebagai Pegawai Pematuhan PLT, dia hendaklahmendaftar dengan Pendaftar agar membolehkannya menyerah simpan atau mengemukakan dokumen-dokumen bagi pihak pekongsi atau PLT. Pendaftaran itu hendaklah dilakukan melalui Portal MyLLP dan Pegawai Pematuhan itu dikehendaki pergi ke pejabat terdekat SSM untuk tujuan pengesahan identiti. Suatu PLT hendaklah memastikan Pendaftar diberitahu jika apa-apa pertukaran dibuat atau berlaku kepada butir-butir PLT yang telah didaftarkan dalam tempoh empat belas hari dari tarikh pertukaran itu dibuat atau berlaku. (viii) apa-apa dokumen lain yang dikehendaki oleh Pendaftar, dari semasa ke semasa, untuk disimpan oleh PLT. (i) Suatu PLT hendaklah menyimpan apa-apa rekod perakaunan dan rekod-rekod lain yang mencukupi untuk menjelaskan transaksi dan kedudukan kewangan PLT itu dan membolehkan akaun untung dan rugi dan menyediakan kunci kira-kira dari semasa ke semasa yang memberi gambaran yang benar dan adil tentang keadaan hal ehwal PLT di pejabat berdaftar PLT atau mana-mana tempat lain yang difikirkan patut oleh pekongsi dengan syarat bahawa Pendaftar diberitahu dengan sewajarnya tentang tempat lain itu. (ii) Suatu PLT hendaklah menyimpan rekod perakaunan dan rekod-rekod lain seperti di atas bagi tempoh tidak kurang daripada tujuh tahun dari berakhirnya tahun kewangan di mana transaksi atau operasi berkaitan rekod-rekod itu telah selesai. (i) Suatu PLT hendaklah memastikan diserah simpan dengan Pendaftar setiap tahun dalam tempoh sembilan puluh hari dari akhir tahun kewangan PLT, satu perakuan yang dibuat oleh mana-mana dua orang pekongsinya bahawa PLT itu boleh atau tidak boleh membayar hutangnya apabila ia perlu dibayar dalam perjalanan biasa perniagaan dan perakuan itu hendaklah disertakan dengan butir-butir lain sebagaimana diperlukan oleh Pendaftar. (ii) Perakuan Tahunan ini, hendaklah diserah simpan tidak lewat daripada lapan belas bulan dari tarikh pendaftaran PLT. FAQs – Part 2 Perkongsian Liabiliti Terhad (PLT)? Mengapakah PLT diperkenalkan di Malaysia? • Untuk memberikan cara menjalankan perniagaan yang mampu dimiliki. Dari segi perundangan, PLT merupakan sebuah pertubuhan perbadanan. Kenapa seseorang itu patut memilih untuk mendaftar sebagai PLT dan bukan mendaftar sebagai perniagaan atau memperbadankan syarikat? PLT memberikan fleksibiliti dari segi pengurusan dalaman sesebuah organisasi yangtertakluk kepada perjanjian di antara rakan kongsi manakala syarikat tertakluk kepada keperluan pematuhan yang lebih ketat yang terkandung di dalam Akta Syarikat 1965. Adakah terdapat apa-apa sekatan berhubung jenis syarikat/perniagaan yang boleh menggunakan PLT sebagai bentuk perniagaan? Tidak. PLT boleh digunakan untuk semua jenis perniagaan yang sah di sisi undang-undang dengan tujuan untuk mendapat keuntungan. Bolehkah badan-badan kebajikan berdaftar sebagai PLT? • surat kelulusan (dalam kes amalan profesional). Bolehkah pendaftaran PLT ditolak atau tidak diterima? Jika ya atas alasan apa? (iii) tujuan yang memudaratkan ketenteraman awam, kebajikan atau keselamatan atau prinsip moral di Malaysia. Adakah terdapat had bilangan rakan kongsi sesebuah PLT? PLT perlu mempunyai sekurang-kurangnya minimum 2 rakan pekongsi dan tiada had maksimum untuk bilangan rakan kongsi. Siapa boleh menjadi rakan kongsi dalam PLT? Individu (orang perseorangan) atau pertubuhan perbadanan sama ada secara keseluruhan atau sebahagiannya. Ya, berhubung apa-apa perkara yang dinyatakan dalam jadual Akta PLT 2012. Bolehkah dua syarikat membentuk PLT? Ya, boleh. Ini merupakan bentuk biasa usahasama. Berapa lamakah SSM mengambil masa untuk memproses permohonan pendaftaran? Suatu notis pendaftaran akan dikeluarkan serta-merta selepas penyerahan permohonan melalui Portal MyLLP dengan syarat semua keperluan pendaftaran dipenuhi. Adakah perlu untuk setiap rakan kongsi itu merupakan “pemastautin” di Malaysia? Tiada keperluan untuk pekongsi menjadi pemastautin di Malaysia tetapi terdapat keperluan agar pegawai pematuhan merupakan warganegara atau pemastautin di Malaysia. Adakah pekongsi PLT akan bertanggungjawab secara peribadi untuk hutang yang ditanggung oleh PLT? • individu yang mana pekongsi berurusan itu mengetahui bahawa pekongsi itu bertindak tanpa kuasa atau tidak mengetahui yang dia seorang pekongsi PLT. Di bawah Akta PLT 2012 terdapat keperluan untuk PLT untuk melantik sekurang-kurangnya seorang pegawai pematuhan. Apakah syarat-syarat bagi seseorang untuk dilantik sebagai pegawai pematuhan PLT? Apakah tanggungjawab dan liabiliti pegawai pematuhan? • Memastikan penerbitan nama-nama PLT menurut peruntukan-peruntukan Akta. Pegawai pematuhan adalah bertanggungjawab secara peribadi terhadap semua penalti termasuklah penalti pentadbiran yang dikenakan ke atas PLT kecuali jika dia dapat membuktikan bahawa dia tidak bertanggungjawab. Bolehkah bilangan pegawai pematuhan lebih daripada seorang? Jika PLT mempunyai dua pekongsi dan salah seorang daripada mereka berhenti daripada menjadi pekongsi atas apa-apa sebab, adakah pekongsi yang masih ada itu perlu melantik pekongsi lain? Adakah terdapat jangka masa untuk berbuat demikian? Ya. pekongsi yang masih ada itu perlu melantik seorang pekongsi lain dalam masa enam bulan atau tempoh yang lebih lama yang boleh ditentukan oleh Pendaftar atas permohonan pekongsi sedia ada dan tempoh lanjutan yang diberi tidak patut melebihi satu tahun. Bolehkah pekongsi yang diisytiharkan bankrap terus menjadi pekongsi? • Mahkamah dengan syarat bahawa suatu notis tentang niat untuk memohokebenaran telah disampaikan kepada KPI dan KPI didengar pada permohonan itu. Bolehkah bentuk perniagaan sedia ada seperti syarikat atau firma perkongsian bertukar menjadi PLT? Ya, boleh. Dalam kes sebuah syarikat, hanya syarikat persendirian yang diperbadankan di bawah Akta Syarikat 1965 dibenarkan. Dalam kes sebuah perkongsian, hanya firma yang berdaftar di bawah Akta Pendaftaran Perniagaan 1956 atau mana-mana firma yang menjalankan amalan profesional dibenarkan. Apakah kedudukan syarikat persendirian atau perkongsian konvensional yang bertukar kepada PLT? Kedudukan syarikat persendirian atau perkongsian konvesional hendaklah disifatkan sebagai telah dibubarkan. Bolehkah pemilik tunggal bertukar kepada PLT? Pemilik tunggal tidak boleh bertukar kepada PLT kerana ia hanya mempunyai 1 pemilik. Pemilik tunggal perlu mendapatkan sekurang-kurangnya satu lagi pekongsi sebelum boleh berdaftar sebagai PLT. Adakah perlu untuk PLT yang telah ditukar untuk memberitahu penukaran tersebut kepada mana-mana pihak yang telah berurusan dengannya sebelum penukaran berlaku? • nama dan nombor pendaftaran, jika terpakai, bagi perkongsian konvensional atau syarikat persendirian itu yang daripadanya perkongsian liabiliti terhad itu ditukarkan. Bolehkah PLT ditukar semula kepada syarikat persendirian? Tidak boleh. PLT perlu membuat penggulungan secara sukarela terlebih dahulu dan kemudiannya memperbadankan syarikat yang baru. Adakah peruntukan perundangan yang sedia ada tidak adil kepada pemiutang kerana pekongsi sedia ada boleh mengelak liabiliti dengan bertukar sahaja kepada PLT? Apakah rasional/remedi untuk ini? Di bawah Akta PLT 2012, adalah diperuntukkan bahawa semua hak dan liabiliti akan dipindah kepada PLT selepas penukaran daripada sebuah syarikat persendirian atau perkongsian konvensional. Bahkan pekongsi kepada perkongsian konvensional yang telah bertukar kepada PLT hendaklah terus bertanggungjawab secara peribadi, bersama dan berasingan dengan PLT untuk liabiliti dan obligasi yang ditanggung sebelum penukaran tersebut. Di bawah peruntukan undang-undang, hak pemiutang juga dilindungi kerana persetujuan pemiutang adalah diperlukan sebelum sesuatu penukaran boleh dibuat. Siapakah yang dianggap sebagai golongan profesional di bawah Akta PLT 2012? Bolehkah dua profesional yang berbeza (contohnya, seorang peguam dan akauntan menjadi pekongsi dalam satu LLP? Tidak boleh. Sebuah LLP ditubuhkan bagi maksud menjalankan amalan profesional hendaklah terdiri daripada orang sebenar yang mengamalkan profesion yang sama sahaja. Ini adalah untuk memastikan bahawa isu-isu integriti dan etika dapat dipantau. Akta PLT 2012 menghendaki golongan profesional mendapatkan surat kelulusan daripada badan kawalselia masing-masing sebelum PLT dibentuk untuk amalan profesional. Adakah syarat ini terpakai untuk golongan professional asing yang berhasrat untuk membentuk PLT di Malaysia? Akta PLT 2012 tidak melarang golongan profesional asing menjalankan amalan profesional di Malaysia. Walau bagaimanapun, ini tertakluk kepada syarat dan kelulusan badan kawalselia berkaitan menurut undang-undang yang mengawal golongan profesional tersebut di Malaysia. Bolehkah PLT asing menjalankan perniagaan di Malaysia? • Salinan sah piagam atau instrumen yang menentukan perlembagaannya, jika ada. Adakah perlu untuk setiap pekongsi itu merupakan “pemastautin” di Malaysia? Tiada keperluan untuk pekongsi menjadi pemastautin di Malaysia tetapi terdapat keperluan agar pegawai pematuhan perlu merupakan warganegara atau pemastautin di Malaysia. Dalam keadaan apakah sebuah PLT boleh digulungkan oleh Mahkamah? PLT boleh digulungkan oleh Mahkamah di bawah keadaan yang sama sesebuah syarikat digulungkan oleh mahkamah sebagaimana yang diperuntukkan di bawah Akta Syarikat 1965. Akta PLT 2012 memperuntukkan bahawa peruntukan-peruntukan dalam Akta Syarikat 1965 berkaitan dengan penggulungan oleh Mahkamah akan terpakai kepada LLP. Bagaimanakah sebuah PLT boleh dibubarkan secara penggulungan sukarela? Jika sesuatu PLT telah berhenti beroperasi dan telah menunaikan semua hutang dan liabilitinya, seorang pekongsi PLT itu boleh memohon kepada Pendaftar untuk penggulungan PLT itu secara sukarela dengan syarat semua keperluan yang dikehendaki di bawah Akta PLT 2012 bagi permohonan penggulungan secara sukarela dipenuhi. Dalam keadaan apakah PLT boleh dipotong daripada daftar? (e) Urusan PLT telah digulungkan sepenuhnya tetapi aset-aset tidak mencukupi untuk membayar kos bagi memperoleh perintah Mahkamah untuk membubarkan PLT. Adakah PLT perlu menguruskan rekod perakaunan? Ya. Semua rekod perakaunan perlu disimpan untuk membolehkan akaun PLT disediakan yang memberikan pandangan sebenar dan adil (true and fair view) tentang kedudukan hal ehwal PLT. Rekod perakuanan hendaklah disimpan untuk tempoh selama 7 tahun. Adakah penyediaan akaun bagi sesuatu LLP perlu mengikut piawaian perakaunan yang diluluskan sama seperti syarat yang dikenakan ke atas syarikat-syarikat dibawah Akta Syarikat 1965? Salah satu objektif utama untuk memperkenalkan bentuk perniagaan PLT adalah untuk memberikan fleksibiliti dalam urusan dalaman sesebuah perniagaan. Sama seperti perkongsian konvensional, peruntukan perundangan PLT tidak menetapkan keperluan penyediaan akaun PLT dibuat mengikut piawaian perakaunan yang diluluskan. Walaubagaimanapun sebuah PLT perlu menyediakan dari semasa ke semasa rekod-rekod perakaunan yang akan memberi gambaran yang benar dan adil mengenai keadaan hal ehwal kewangan PLT. Tiada keperluan untuk pengauditan mandatori untuk PLT. Perlukah PLT mengemukakan Penyata Tahunan? Tidak. Bagaimanapun, PLT perlu mengemukakan Deklarasi Tahunan kepada Pendaftar dengan menyatakan sama ada PLT mampu membayar hutangnya atau sebaliknya. Perlukah PLT mengadakan Mesyuarat Agung Tahunan? Tiada keperluan untuk PLT mengadakan Mesyuarat Agung Tahunan..
FAQs – Mengapa PLT diperkenalkan di Malaysia? FAQs – Kenapa perlu mendaftar PLT dan bukan Enterprise atau Sdn. Bhd.? PLT memberikan fleksibiliti dari segi pengurusan dalaman sesebuah organisasi yang tertakluk kepada perjanjian di antara rakan kongsi manakala syarikat tertakluk kepada keperluan pematuhan yang lebih ketat yang terkandung di dalam Akta Syarikat 1965. FAQs – Adakah terdapat apa-apa sekatan berhubung jenis syarikat / perniagaan yang boleh menggunakan PLT sebagai bentuk perniagaan? FAQs – Bolehkah badan-badan kebajikan berdaftar sebagai PLT? 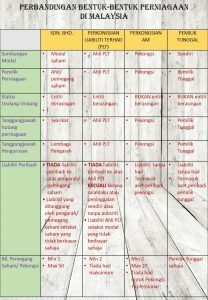 FAQs – Panduan Pendaftaran Perkongsian Liabiliti Terhad (PLT). 1. Perkongsian Liabiliti Terhad atau PLT adalah satu bentuk perniagaan baru yang akan melengkapkan pilihan tradisional menjalankan perniagaan sama ada dengan cara pemilikan tunggal, perkongsian atau syarikat. PLT ditadbir oleh Akta Perkongsian Liabiliti Terhad 2012 (Akta 743) (‘Akta PLT 2012′). 2. Suatu PLT menggabungkan cirri-ciri sebuah syarikat dan perkongsian yang memberikan perlindungan liabiliti terhad untuk rakan-rakan kongsinya dan fleksibiliti peraturan perkongsian untuk pengurusan dalaman perniagaannya. PLT memberikan fleksibiliti dan kebebasan kepada usahawan dan pelabur untuk memilih model perniagaan terbaik dan keperluan untuk struktur perniagaan berkaitan. 4. Borang pendaftaran itu hendaklah diserah simpan dengan Pendaftar Perkongsian Liabiliti Terhad (‘Pendaftar’) oleh pegawai pematuhan.  Semua maklumat lain yang dikehendaki untuk pendaftaran PLT baru sebagaimana dinyatakan dalam perenggan 3 di atas. 6. Fee pendaftaran untuk pendaftaran PLT baru atau untuk penukaran kepada PLT adalah RM500 dan dibayar kepada SSM. Jika anda menggunakan khidmat pihak ke tiga, ianya tertakluk kepada Fi Perkhidmatan yang diambil oleh syarikat tersebut. 7. Hak dan kewajipan bersama pekongsi-pekongsi PLT dan hak dan kewajipan PLT hendaklah ditentukan oleh perjanjian PLT. 8. Walau bagaimanapun ketiadaan perjanjian berhubung apa-apa perkara yang dinyatakan dalam Jadual Kedua Akta PLT 2012, peruntukan Jadual Kedua berkaitan perkara itu hendaklah terpakai. 10. Selepas seseorang itu dilantik sebagai pegawai pematuhan PLT, dia hendaklah mendaftar dengan Pendaftar agar membolehkannya menyerah simpan atau mengemukakan dokumen-dokumen bagi pihak pekongsi atau PLT. 11. Pendaftaran itu hendaklah dilakukan melalui Portal MyLLP dan pegawai pematuhan itu dikehendaki pergi ke pejabat terdekat SSM untuk tujuan pengesahan identiti. (e) Apa-apa perkara lain yang dikehendaki oleh Pendaftar untuk dilakukan oleh PLT dari semasa ke semasa di bawah Akta PLT 2012 dan/atau Peraturan PLT 2012. (a) Pendaftaran pertukaran butir-butir Suatu PLT hendaklah memastikan Pendaftar diberitahu jika apa-apa pertukaran dibuat atau berlaku kepada butir-butir PLT yang telah didaftarkan dalam tempoh empat belas hari dari tarikh pertukaran itu dibuat atau berlaku. (i) Suatu PLT hendaklah memastikan diserah simpan dengan Pendaftar setiap tahun dalam tempoh sembilan puluh hari (90 hari) dari akhir tahun kewangan PLT, satu perakuan yang dibuat oleh mana-mana dua orang pekongsinya bahawa PLT itu boleh atau tidak boleh membayar hutangnya apabila ia perlu dibayar dalam perjalanan biasa perniagaan dan perakuan itu hendaklah disertakan dengan butir-butir lain sebagaimana diperlukan oleh Pendaftar. belas bulan dari tarikh pendaftaran PLT.